The fourth guitar of my Live Edge series, Electrical Storm is a sonic force of nature. A multiscale six-string guitar neck was not enough for me- I added 5 sub-bass strings to bring thunder to the lightning. Both of those necks are made of monolithic Ziricote. This slick, incredibly dense wood needs no truss rod or carbon fibre. Off the guitar, they ring like a bell when struck. On the guitar, they add resonance and character to every note. The body is hand-carved from a spectacular wedge of figured black walnut. 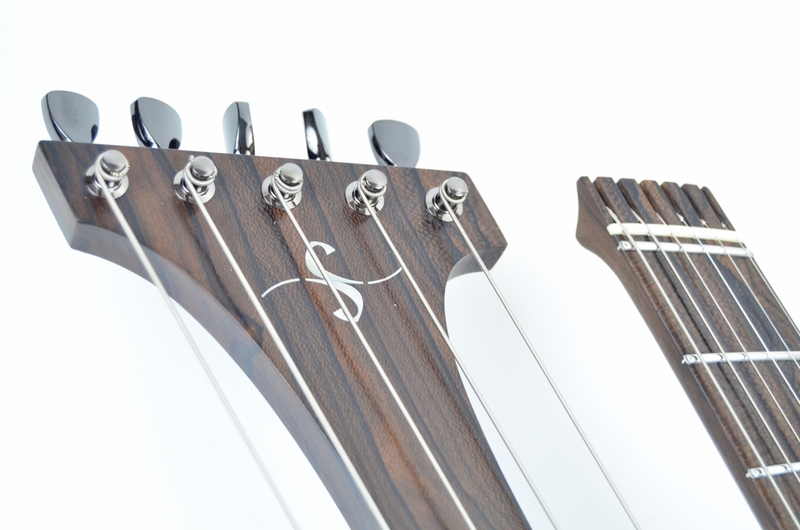 Between the considerable sculpting, the headless hardware by T4M, and the minimalist Gotoh Stealth tuners on the Harp neck, it is one of the most compact and manageable harp-guitars ever made. Each side has a dedicated split-single pickup custom built for me by Ezi Pickups, which are fed to a stereo endpin jack. For optimum results, a stereo Y-cable is used to feed the signal to separate, dedicated amplifiers.